5 Bedroom Detached House For Sale in Tadworth for Guide Price £875,000. 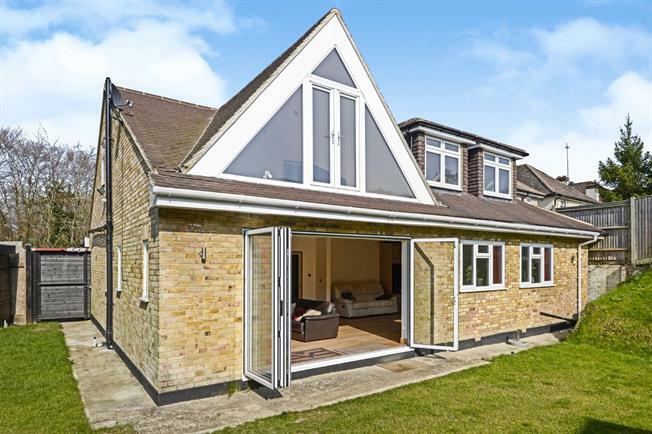 Recently refurbished throughout, this attractive four/five bedroom chalet style house offers expansive and flexible accommodation. The superb kitchen opening onto the living area certainly has the wow factor and there is a separate playroom/ bed 5 and a shower room. The large double bedroom on the ground floor has an en-suite bathroom. On the first floor there are three good sized bedrooms, the master has floor to ceiling windows, large dressing room and en-suite with bath and separate shower. At the top of the garden is a fantastic office with power and is fully wired for business. To the side of the house there is a large workshop/ studio as well as a sauna room with shower. The garden is well designed with areas for dining and play.